The good: Temple Run 2 comes with better graphics.It has more path variation,various power ups and even new types of obstacles.These additional features makes it the most popular game for iOS. The bad: In application purchases gives users the freedom of unlimited “continues. The bottom line: Temple Run 2 is an excellent sequel of original Temple Run withlots of new content, .Users want to play again and again to cross multiple obstacles and improve their run up taking coins and pass the top scores with Wow. Temple Run 2 was released earlier this month for Apple iOS and then became part of Google Play store for Android’s this week. 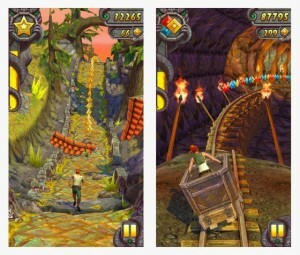 Temple Run 2 playing strategy is almost similar to original Temple run. However some new additions in the game makes it more fun to play.The new additions includes ability to swing from ropes and various landscapes. 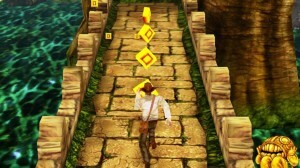 Unlike first Temple Run, the player need to escape from the hands of a giant monkey that is in the temple.The monkey appears like floating in the sky. The player also can put himself into a cart and go through mines. Temple Run 2 is more smoother to play than the original Temple run version. It comes with new obstacles, that includes flowing rivers and instead of a bunch monkey creatures chase a giant monkey wants to grasp player.Temple Run 2 has total of 4 playable characters that can be unlocked with more points earned.Each character has his own special abilities. 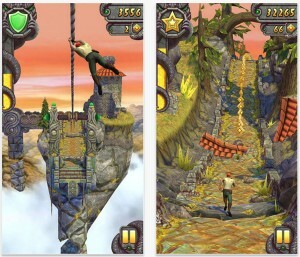 Temple Run is based on simple technique in which a player runs cross different obstacles either by jump ,swing or skidding and collects the gold coins.As you earn more points you have the opportunity to unlock different players,run faster,get the wings or magnet etc. The player is navigated via touch screen. Tilting the screen helps the runner to easily collect coins from either side and poor navigation or striking the player against the wall slows down players speed to be eaten by bunch of monkeys. 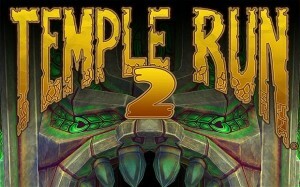 Temple Run 2 developer has done a great job as he has not diverted the game from its initial fun but added new features to make the game more worthy.In temple run 2 player with zip lines can speed down and in a mine cart section has to lean from left to right as he ride fast and furious on the rails underground.The major difference in Temple run 2 is the game’s graphics. fire hazards.The fire hazard gives a Realistic-look keep so player is on toes.Player comes across green gems also that let player to continue run even after a death. But if the player continues on the previous run the cost doubles. Temple Run 2 is absoultely free to download from your Google play store.However users can buy more gems with the help of in-app purchases option. This helps the players who wants to pay to continueas much as he can afford and he wants thus makinghim the top most scorer of the leaderboards. Overall Temple Run 2 is an excellent game and is one of my favourites. What’s your opinion…?